Huchu, Tendai. 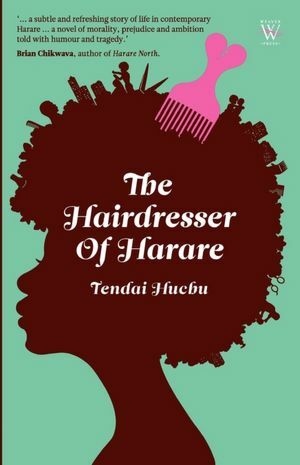 “The Hairdresser of Harare”, Weaver Press, 2010. I had no idea what to expect when I started to read “Hairdresser” and I found myself totally intrigued with the story of Vimbai, a hairdresser at Mrs. Khumalo’s salon. Vimbai is depended upon by many clients but things change when handsome and smooth-talker, Dumisani, comes to work with her. The fact that he is filled with charm bothers Vimbai and her cool exterior comes tumbling down. Needing somewhere to live, Dumisani rents a place from Vimbai and he asks her to go with him to a family affair, a wedding and there she discovers that he comes from one of the wealthiest and most respected families in Harare. Vimbai receives a warm welcome and before long a relationship begins between the two hairdressers. Both of them have their own agendas, however and secrets are exposed and jealousies emerge. Vimbai tells this sensitive story of how her life changed with the entrance of Dumisani. For one thing, competition in hair styling began between them and it is questionable whether the two can work together. Dumisani is something of a mystery and as the story continues we learn more about both him and Vimbai. Vimbai is a very determined woman and she takes care of herself. Life is a struggle and Zimbabwe is not an easy place. Vimbai faces challenges all of the time and the way she lives is a microcosm of life in her country. Economics, politics and society are not easy to deal with and the author does a wonderful job of bringing these issues into the novel. It is ironic that Dumisani becomes the best hairdresser in the salon and instead of being jealous, Vimbai likes him and the jealousy, while there, is played down. She learns that he has a secret but she manages to get over the shock. I know nothing about Zimbabwe and this gave me more reason to want to read this book. While it is fiction, it contains information about real issues in the country one of which deals with Dumisani’s secret (and I bet you can guess what it is). I loved feeling like I was spying on Vimbai as I listened to her thoughts. As the novel progresses, we begin to have a sense of uneasiness and we feel we have to warn Vimbai about what is to come. When the secret is revealed, the novel becomes sad and I thought to myself. This is one of the most realistic novels that I have read in a very long time. The writing is both literate and smooth and this is a pleasure of a read. This entry was posted in GLBT fiction on April 30, 2012 by Amos.